The Forest Hills Five-Piece Dining Set includes four cushioned chairs each featuring a button-tufted back cushion. All of the cushions are self reversing, extremely comfortable and have easy &quot;snap on/off&quot; tabs for quick and trouble-free cleaning. The chair frames are constructed using powder-coated steel to resist rusting and are tested to hold up to 250 pounds. The tabletop is made using tempered glass for safety, has a hole for an umbrella and, along with the chairs, is finished in a matte espresso finish with a three-year warranty. The chairs included in this dining set are stack-able during the off season for ease of storage. You, your family and friends will want to spend more time together outdoors with this accommodating set at the ready. Pair it with our Mainstays Forest Hills Eight-Foot Umbrella in Hemp for a custom look. This set is a great place to refresh and relax in your own personal oasis! The Forest Hills Five-Piece Dining Set includes four cushioned chairs each featuring a button-tufted back cushion. All of the cushions are self reversing, extremely comfortable and have easy "snap on/off" tabs for quick and trouble-free cleaning. The chair frames are constructed using powder-coated steel to resist rusting and are tested to hold up to 250 pounds. The tabletop is made using tempered glass for safety, has a hole for an umbrella and, along with the chairs, is finished in a matte espresso finish with a three-year warranty. The chairs included in this dining set are stack-able during the off season for ease of storage. 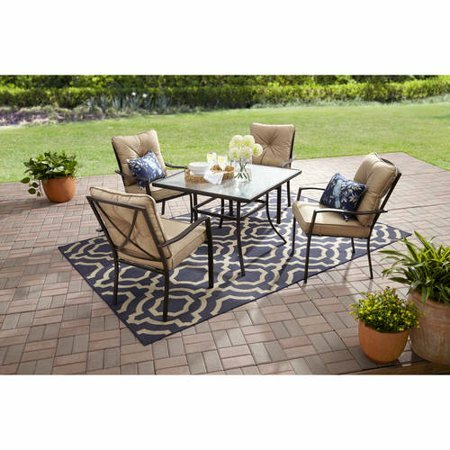 You, your family and friends will want to spend more time together outdoors with this accommodating set at the ready. Pair it with our Mainstays Forest Hills Eight-Foot Umbrella in Hemp for a custom look. This set is a great place to refresh and relax in your own personal oasis! Great table, worth the money! I am very happy with this purchase! I bought it during the winter on clearance. It took 2 of us to build it and it was done within an hour and a half. The table is strong and so are the chairs. Very nice patio set for the money! Chairs and table are well made. Cushions are made from a canvas type material. Cushions are stylish and comfortable. The bottom cushions each have 4 snap on cushion holders that keep the bottom cushions in place. I wish they had put snap on cushion holders for the back pillows/cushions. The table was easy to assemble. The couplings the legs slip into then get screwed in are made of plastic. They should of used a better/heavier grade of plastic or used metal. I purchased this set last summer in order to have extra seating for a party we were having, but for the price I wasn't expecting very much. What a surprise because this is a great dining set. The quality is wonderful for the money, and the size doesn't take up too much space. The chairs are much more durable than expected with cushions that are really nice and waterproof. I love that they have tabs to hold them in place. I got lots of compliments on how nice it was and we are looking forward to using it again this summer. This set was a housewarming gift. We love it. Table needed to be assembled but was very easy and quick to do. Cushions have clips to stay on chairs. Comfortable and was perfect size for my lanai. I sure am disappointed. I ordered this set and it comes in two shipments. One with the chairs, one with the table. The chairs arrived nine days after I placed my order. No table. My email said it was damaged in shipping and they were sending it back. They are supposed to send me a new shipment but in the meantime, I still don't have a patio set and I have to wait again. So disappointed!